The home is a modern 2 bedroom property that sleeps up to 6 guests with a pull out sofa bed in the sitting with 1 double and 1 twin bedroom. It has a large secure decking area safe for children and dogs. The unit itself is complete with all the facilities that you would expect. There is central heating and double glazing and usb charging sockets in every room. The kitchen has a gas hob with fan assisted electric oven, fridge / freezer, microwave, kettle and toaster along with all the cutlery, crockery and utensils. The living room has a large sofa with a 32" smart tv, DVD player, bluetooth DAB radio with usb charging socket, 2 portable weatherproof bluetooth speakers / lanterns / power-banks for outside or inside use, a hard drive connected to the tv with a large variety of family films, Disney films, comedies, music etc, DVD's, games and books. Even the table lamp has a usb charging point. Both bedrooms have plenty of storage with wardrobes with drawers and hangers, charging sockets, bluetooth DAB clock radios and a hairdryer. The bathroom has a large powerful shower. An iron, ironing board, clothes dryer, vacuum cleaner etc are all provided as is bedlinen. Please bring your own towels. The outside decking area has a dining area and additional seating with small drinks table, 2 led security lights and a remote controlled floodlight for al fresco dining. There is so much to do in this area on both good and wet days. It is a short drive to Bournemouth / Poole and the famous Sandbanks, Southampton and Portsmouth with the Spinnaker Tower, HMS Victory and Gunwharf Quays, the cathedral cities of Winchester and Salisbury not forgetting about Stonehenge. For Children nearby is Paultons park with Peppa Pig World, Beaulieu National Motor Museum, Longleat, Bournemouth Aquarium, Moors Valley country park with Go Ape etc. And of course a day trip to the Isle of Wight which can be reached from Lymington close by, either as a foot passenger or by car. We live in Salisbury, Wiltshire about 50 minutes drive away. We both work very hard and bought this holiday home to relax in when we get the time - unfortunately that is not to often! I run a car business and my wife is a teacher. We are both active people and very well travelled. We have always loved the New Forest and the beach / sea, so this seemed like the obvious place to buy a property. Hopefully you will think the same. We have tried to provide a comfortable and well equipped holiday home with a relaxed feel. 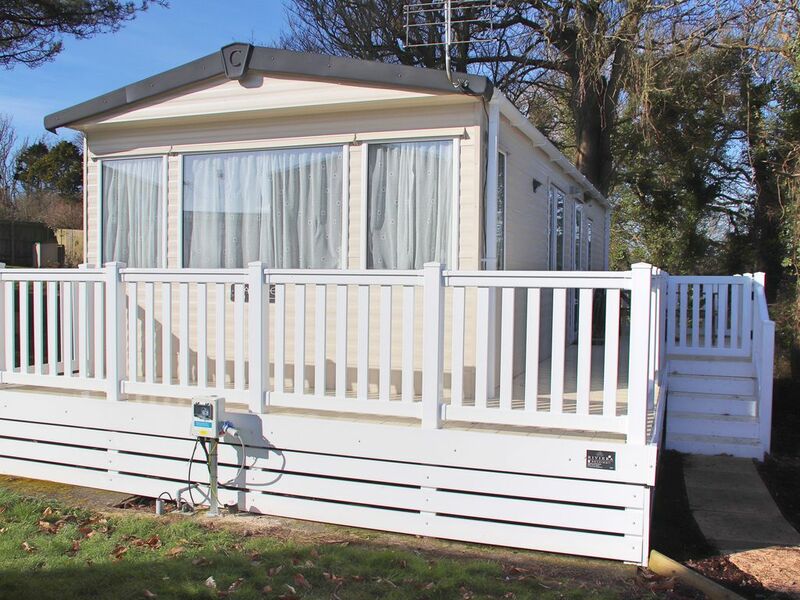 In a 5 star country park, close to the beaches and New Forest as well as all the local amenities such as supermarkets, pubs, shops, takeaways and the like. The bathroom has a large powerful shower and is centrally heated and double glazed. There is plenty of storage and shower gels, shampoo, conditioner and body lotion are supplied together with a first aid kit and painkillers if needed. Full central heating supplied by a gas combination boiler. Bedding and tea towels are provided together with 2 sets of towels. Placed above wardrobe in main bedroom. Free parking for up to 2 cars outside the property. Free Wi Fi throughout the park. 2 sets of towels and tea towels. Full fitness suite within the leisure complex. Spacious living room that easily accommodates 6 people on the sofa with a large central coffee table. Under counter with a freezer box and ice tray. Tea, coffee and sugar are provided along with salt, pepper, vinegar, herbs, chilli sauces and the like. Everything you could need including children's and adult's outdoor cutlery, crockery and glasses. The kitchen comes complete with a microwave, gas hob, fan assisted oven, toaster, kettle, mini chopper and all the cooking utensils, cutlery, crockery you could ever need. Rectangular table with 4 chairs. DAB bluetooth portable system with usb power bank etc & bluetooth portable speaker with lantern and power bank. A good selection of children's and adult books. A variety of children's and family games. Large selection of albums on the hard drive attached to the television. Housed within the leisure complex. Various children's and family DVD's. Wood chipped area with shrubs and plants with a patio area. Again available to hire locally. Boat hire is available locally. Wrap around terrace on 2 sides of the caravan. Lovely golf club at Barton on Sea about 1 mile away. Great caravan. Spotlessly clean and great location on the site. Had a superb short break here.Caravan had everything and more provided by the owners and it's location was great. Located in a quiet cul de sac but close to all the facilities and path to beach. Brilliant guests and would love them to stay again. They left the place beautifully clean and would highly recommend them to another host. Thank you so much for your feedback. I am really happy that you enjoyed your stay, and you are more than welcome back at any time. the caravan's location is perfect: sea, the forest... Perfect! Fantastic guests and are more than welcome to stay again anytime. The property map is not very accurate! The actual plot is Woodland View 58a. If you look at a map of Shorefield country park from their website, you will see the exact location.